The new activity products marketplace solution is unique in its scale in Finland’s travel business. Visit Rovaniemi’s new digital marketplace on www.visitrovaniemi.com/activities has exceeded all expectations. During the first opening month in December 2018 – January 2019 sales crossed over 100 000 euros despite the fact the marketing of new platform is yet to start. The buying customers are international. Launching the new online-marketplace makes Visit Rovaniemi the first regional travel board in Finland to open large-scale booking channel that collects products from all around the area to a one place. At this point, only activity products are available. Products succeeding the best are northern lights safaris, dog sledding, reindeer sleigh rides and activities that combine the previous. Sales on Visit Rovaniemi’s tourist info has increased gradually every year. Online sales are additional to that. Visit Rovaniemi built the marketplace using tourism sales platform Bokun that makes reselling and cross-selling of tourism products easy. It’s a software platform that makes collecting products to one marketplace possible. Excellent start of sales has amazed also Bokun’s staff. 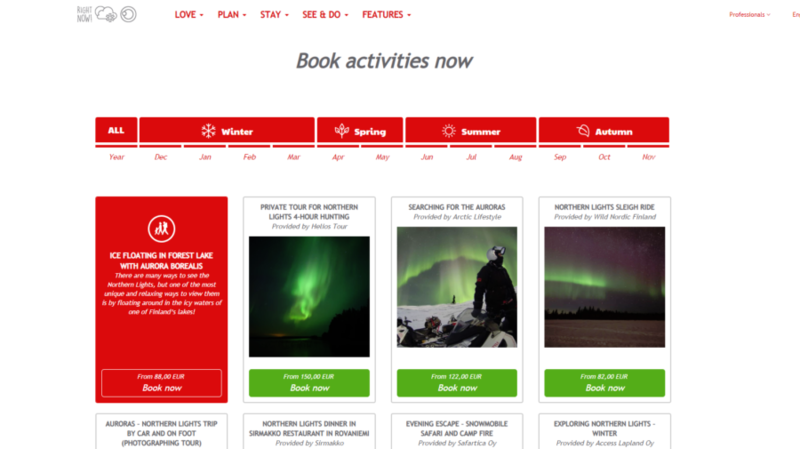 “Visit Rovaniemi’s new booking platform has been one of the most impressive sale launches the Bokun team has been a part of”, says Völundur Jónsson, Solution Architect in Bokun. Visit Rovaniemi has 86 shareholder companies that operate activities in Rovaniemi, Lapland, Finland. Currently 24 of them have taken Bokun as their sales platform and thus their products have access on Visit Rovaniemi’s online marketplace. Rovaniemi-based safari house Safartica is one of the companies that is selling activities on the new marketplace. “We had no expectations to what the sales are going to be, so we’re just glad that sales are running on the new channel”, says Antti Antikainen, sales manager of Safartica. To become a Bokun-user and a part of the marketplace requires compiling the activity product to a digital form and feeding the products to the system. On Visit Rovaniemi’s web page, the products can be filtered by the category, hence a customer can compare the products effortlessly. Good visual images and carefully written product description boost the sales. The digital platform enables the year-round selling of products in Rovaniemi. At the moment, there’s more than 120 products from all seasons. “Bokun is a tool that makes summer’s marketing easier, as it brings the extensive and interesting selection of products to one place. It’s handy and agile for a customer to buy activities whatever time wherever in the world”, Sanna Kärkkäinen, CEO of Visit Rovaniemi, says. Visit Rovaniemi is part of Visit Finland’s digital development pilot that aims at making Finland digitally easily reachable travel destination by 2020. Coca-Cola Christmas Truck makes a historical first-ever stop on the Arctic Circle to meet Santa Claus and his reindeer The Coca-Cola Christmas Truck has visited over 300 places around the globe before finally arriving in Finland. In Finland the truck made a historical first-time ever stop on the Arctic Circle in the city of Rovaniemi.